Seems like the instant stardom of 'winking girl' Priya Prakash Varrier is spreading like wildfire across the social media. The winking video of Priya Prakash Varrier from Oru Adaar Love has not only caught the attention of youngsters, but also charmed Bollywood celebrities as well. On Friday, none other than veteran Bollywood actor Rishi Kapoor took to his Twitter page to congratulate Priya on becoming the national crush of India. 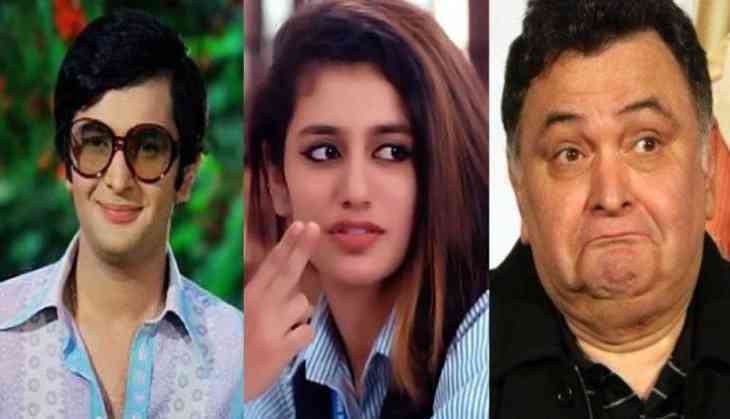 Praising Priya Parakash Varrier, Rishi Kapoor predicted “huge stardom” for her and even asked her why she wasn’t there during his time! "I predict huge Stardom for this girl. Priya Warrier. So expressive,coy coquettish yet innocent. My dear Priya, you going to give all others in your age group a run for their money. God Bless and the best to you! Mere time mein naheen ayeen aap! Kyon? Lol", Rishi Kapoor tweeted. Meanwhile, Priya Prakash Varrier Varrier has credited her co-star Roshan Abdul Rahoof for creating the moment by tweaking his eyebrows first. Priya and Roshan are seen doing a see-saw with their eyebrows before Priya surprises him with a wink and a flirtatious smile in the song video. "I would like to be known as a good actor rather than being known as the wink queen. This is a new feeling. But I am happy. The song has received good response. Our director told us that the 30-second shot should be a memorable one and we followed his vision. I never expected that it would become such a big hit. It is a school-centric film. We are discussing love, crushes and friendship. Love in the time of schooling is the theme of the film", Priya Prakash Varrier said.